New Directions Publishing Corporation, 9780811219242, 546pp. 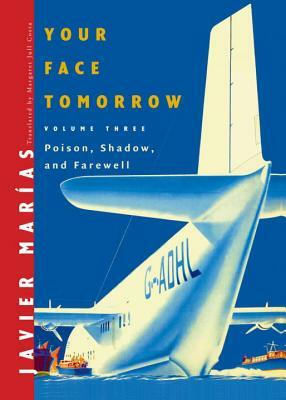 Poison, Shadow, and Farewell, with its heightened tensions between meditations and noir narrative, with its wit and and ever deeper forays into the mysteries of consciousness, brings to a stunning finale Mar as's three-part Your Face Tomorrow. Already this novel has been acclaimed "exquisite" (Publishers Weekly), "gorgeous" (Kirkus), and "outstanding: another work of urgent originality" (London Independent). Poison, Shadow, and Farewell takes our hero Jaime Deza--hired by MI6 as a person of extraordinarily sophisticated powers of perception--back to Madrid to both spy on and try to protect his own family, and into new depths of love and loss, with a fluency on the subject of death that could make a stone weep.